4 IN WHICH CASES DOES DIRECTIVE 94/9/EC APPLY? The manufacturer, his authorised representative or the person who first places a product on the EU market or puts a product into service in the EU market has to decide whether it is covered by the Directive 94/9/EC and, if so, apply its provisions. The manufacturer (in the broadest sense of the Directive) must therefore make an ATEX analysis on the basis of Directive 94/9/EC. 4.1.1 What is a potentially explosive atmosphere in the sense of Directive 94/9/EC? Directive 94/9/EC is a directive following the "New Approach" and therefore is intended to enable the free movement of goods within the EU. This is achieved by harmonisation of legal safety requirements, following a risk-related approach. Its objective is also to eliminate or at least minimise the risks resulting from the use of certain products in or in relation to a potentially explosive atmosphere. The manufacturer has to make assumptions about the intended use of his product including the contact with potentially explosive atmospheres. iv) in which, after ignition, the combustion spreads to the entire unburned mixture (It has to be noted that sometimes (mainly with dusts) not always the whole quantity of the combustible material is consumed by the combustion). An atmosphere, which could become explosive due to local and/or operational conditions, is called a potentially explosive atmosphere. It is only this kind of potentially explosive atmosphere which products falling under the Directive 94/9/EC are designed for (see as well chapter 4.3 ‘Risk Assessment’). It is important to note, that products are not covered by Directive 94/9/EC where they are intended for use in or in relation to mixtures which might potentially be explosive, but one or more of the defining elements i) to iv) above are not present. • A product within a potentially explosive mixture without the presence of air is not in the scope of the Directive23. Special processes of this type require equipment that has been specially designed for the risks, as equipment intended for use in potentially explosive atmospheres may pose an ignition hazard for mixtures under non-atmospheric conditions. 22 The Directive 94/9/EC does not define atmospheric conditions. However, a surrounding temperature range of –20°C to 60°C and a range of pressure between 0.8 bar and 1.1 bar may be appropriate as a basis for design and intended use of products. This does not preclude that products may be specifically designed and assessed for operation occasionally outside these conditions. It should be noted that electrical products are normally designed and tested for use in the ambient temperature range –20°C to 40°C in conformity with the harmonised standards. Products designed for use outside of this range will require additional marking to be added and further testing as appropriate. This will normally require agreement between the manufacturer and intended user. 23 Examples for such atmospheres could be: mixtures which are explosive without air (e.g. H2 mixed with Cl2), mixtures of flammable substances with other oxidants than air, pressure and/or temperature conditions outside the atmospheric range, etc. • Conveying equipment where some parts but not all are under atmospheric pressure with internal pressures different from atmospheric pressure can fall under the scope of Directive 94/9/EC. When performing a risk assessment it will become evident that although parts of the described equipment are outside the scope of Directive 94/9/EC during normal operation (pressure oscillates between too low and too high values in relation to "atmospheric conditions") some parts or spaces still are under the scope and that the whole equipment during start-up and shut-down is under the scope, at least. a) A vapour recovery pump for petrol stations is connected at its inlet and outlet to a potentially explosive atmosphere in the sense of Directive 94/9/EC. b) A vacuum pump sucking from a vacuum container and conveying the mixture into a pressure vessel or pressure line. In this case the inner parts of the pump are not connected to a potentially explosive atmosphere in the sense of Directive 94/9/EC. Note: The manufacturer may wish to sell this equipment for use under atmospheric conditions of the inlet and outlet side additionally, and then case a) applies. In any case, the complete working cycle needs to be considered, including start-up and shut-down, which may cause an atmospheric pressure to exist. If the equipment is not intended for atmospheric use, the Directive does not apply. Risk assessment must be carried out according to Directive 1999/92/EC. As long as the user is not able to ensure the absence of a potentially explosive atmosphere, start-up and shut-down are relevant to determine the application of the Directive. 4.1.2 Which kinds of products are covered by Directive 94/9/EC? To be within the scope of the Directive, a product has to be: a) equipment, as defined in Article 1.3. (a); or b) a protective system, as defined in Article 1.3. (b); or c) a component, as defined in Article 1.3. (c); or d) a safety, controlling or regulating device as defined in Article 1.2.
the existence of interfaces to different potentially explosive atmospheres (section 4.1.2.4). Inerting systems are aimed at reducing or completely preventing the existence of an explosive atmosphere in specific areas. Inerting systems are not, however, intended to stop or restrain incipient explosions; hence they are not protective systems within the meaning of Directive 94/9/EC. The goal of inerting systems is different from those of explosion suppression systems, which may sometimes have similar parts, but are aimed at restraining an incipient explosion. In broad terms: inerting systems used during operation of plants etc. are normally not in scope of Directive 94/9/EC. The intended effect of an inerting system applied to inert a tank can only be assessed after knowing all operational parameters of the volume to be inerted. This assessment and the functional aspects of such systems are not covered by Directive 94/9/EC but a duty to be considered by the user and has to be laid down e.g. in the explosion protection document under the scope of the Directive 1999/92/EC and its national transpositions. An inerting system may (in part) also consist of parts which are intended for use within an explosive atmosphere and which have a potential ignition source of their own. These parts come – individually or possibly combined – under the scope of Directive 94/9/EC as "equipment". Also in this case their function of preventing an explosive atmosphere by inerting is not to be assessed within the meaning of this Directive. 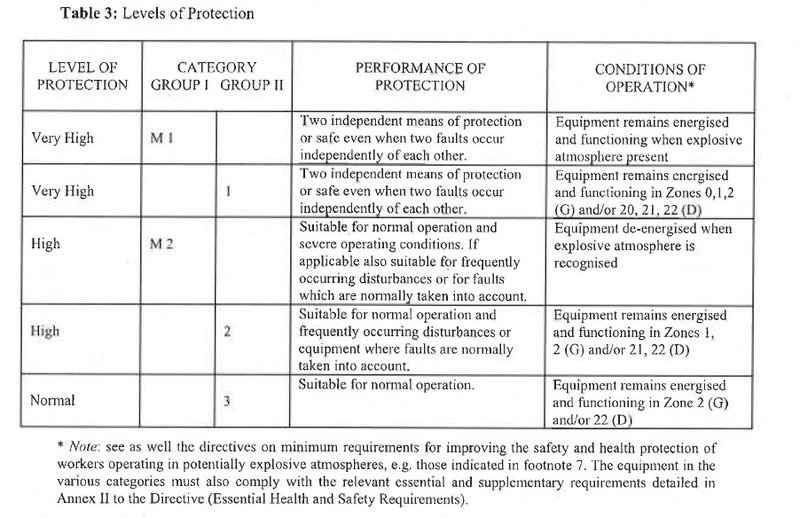 In some cases, such systems may be part of the ignition protection concept of "explosion protected" equipment to fulfil the requirements of Annex II to Directive 94/9/EC, i.e. if they work as a means to protect potential ignition sources of the equipment from coming into contact with an existing potentially explosive atmosphere. This equipment, including its inerting system, comes as part of the equipment under the scope of Directive 94/9/EC. This inerting system is not a protective system according to Article 1(1). Its parts may be safety, controlling and regulating devices according to Article 1(2) of Directive 94/9/EC when separately placed on the market. In broad terms: Directive 94/9/EC applies to an inerting system, if this system is – or is intended to be – integrated into the ignition protection concept of the equipment and thus serves to avoid ignition sources of the equipment. Where the manufacturer of equipment intended for use in potentially explosive atmosphere wants to protect the ignition sources of this equipment, he may use the type of protection "pressurisation" according to EN 50016. This type of protection may include the use of inert gases as protective gases. In this case the inerting system is part of the equipment and as such within the scope of Directive 94/9/EC. The following case may occur in practice: Equipment according to Article 1 of Directive 94/9/EC contains an enclosure or a vessel containing sources of ignition. In order to prevent an explosive atmosphere from coming into contact with the ignition sources, an inerting system, which has been assessed in accordance with the 94/9/EC Directive as a safety device, can be applied to this equipment. These products are an enclosed area, where an operator may work inside or outside, and may be described as a "simple box". The "box", with no ignition source and not intended for use in a potentially explosive atmosphere, does not fall within the scope of the ATEX Directive 94/9/EC. Under operating conditions a potentially explosive atmosphere is created and the enclosed area, openings and recovery systems are normally assessed with regard to the explosion risk. The equipment, protective systems and components intended for use in this assessed potentially explosive atmosphere including safety and controlling devices outside, but contributing to their safe functioning, are within the scope of the ATEX Directive 94/9/EC. In summary, paint spray booths, as an integral whole, do not fall under scope of the ATEX Directive 94/9/EC and as such cannot be affixed with the special marking for explosion protection and other marking detailed at Annex II, EHSR 1.0. of the Directive. Manufacturers of explosion protected equipment (e.g. in cases where potentially explosive atmospheres are conveyed) sometimes feel unsure whether and to what extent their products are covered by Directive 94/9/EC (see chapter 3.7.1). This applies especially to cases where only parts of the equipment are in contact with the explosive atmosphere. Directive 94/9/EC deals with the special risk of explosion and has one major aim to prevent "own potential sources of ignition" (Art. 1(3)a) of equipment and protective systems (as far as it has an own potential source of ignition) from becoming active. Beside Art. 1(4) no restrictions are made with regard to local and technical conditions. The probability of occurrence of the potential source of ignition determines the category. The technical requirements are summarised in Annex II 1.0.1; especially the 2nd indent describes the importance of the potential of the source of ignition. For this effect the place of installation is not decisive (see Art. 1(2) safety-, controlling-, regulation devices), but the possible effect of the potential source of ignition on a potentially explosive atmosphere. In the light of these ideas the place of installation "in, at or beside" a potentially explosive atmosphere is not decisive for the application of Directive 94/9/EC. The decisive fact is whether the potential sources of ignition of an equipment are in contact – or have an interface – to a potentially explosive atmosphere, with the effect that the combustion may spread to the entire unburned mixture (see definition "explosive mixture"). In this case the potential source of ignition is in the potentially explosive atmosphere. Equipment may have an internal explosive mixture (without limitation to dangerous quantities), which has an interface in the sense of a spreading of the combustion to a potentially explosive atmosphere even in the case it is not installed completely inside a potentially explosive atmosphere. An example could be an extraction system installed outside the potentially explosive atmosphere with a ventilator – own potential source of ignition – which exhausts explosive atmosphere out of a storage tank, or another potentially explosive atmosphere, via a pipe acting as connecting interface to the potentially explosive atmosphere. It is important to underline in this context how machinery having a potentially explosive atmosphere inside under operating conditions, but having no interface to external potentially explosive atmospheres has to be considered. Such machines, as an integral whole, do not fall under scope of the ATEX Directive 94/9/EC (see also chapter 4.1.2.2 and 4.1.2.4). "Machinery must be designed and constructed in such a way as to avoid any risk of explosion posed by the machinery itself or by gases, liquids, dust, vapours or other substances produced or used by the machinery. See also the "Guide to application of the Machinery Directive 2006/42/EC", § 91 and § 228. It is therefore evident that equipment, protective systems and components intended for use in this potentially explosive atmosphere – and safety and controlling devices outside, but contributing to their safe functioning – are within the scope of the ATEX Directive 94/9/EC. It is understood that the latter applies provided that "atmospheric conditions" in the sense of Directive 94/9/EC are present in the machine. 1. Has the manufacturer the obligation to perform a zone classification inside this machinery? as opposed to the fully harmonising scope of the Machinery Directive, the zone concept applied in the framework of the ATEX "user" Directive 1999/92/EC allows member states to apply more stringent requirements than those defined in this Directive. Purchase or produce the equipment having those requirements, i.e. intended to be used under the conditions defined during the risk analysis, and in conformity to Directive 94/9/EC. 2. Must the ‘non-electrical’ equipment used inside this machinery be also in conformity to 94/9/EC? The equipment used inside must be in conformity to the applicable legislation. When the original Machinery Directive 89/392/EEC was drafted, European Directives regulated only electrical equipment for use in potentially explosive atmospheres; therefore non-electrical equipment was not mentioned. It is nevertheless common understanding of the Standing Committee that after the date of application of Directive 94/9/EC, both electrical and non-electrical equipment used in machinery having a potentially explosive atmosphere inside must comply with Directive 94/9/EC. This position is also reflected in the Machinery Directive 2006/42/EC. This point seeks to provide guidance on the application of ATEX Directive 94/9/EC to equipment24 intended to operate with interfaces to different potentially explosive atmospheres. At this point it is necessary to note that equipment that contains a potentially explosive atmosphere but is neither connected to, nor intended for use in, an external or process related potentially explosive atmosphere does not fall under the scope of Directive 94/9/EC. However, any equipment inside this "container" will, so long as it fulfils the criteria for inclusion in scope, need to comply with the relevant provisions. The categorisation of equipment is to be determined on the basis of the ignition risk assessment25 by the manufacturer or his authorised representative and the equipment's relationship with respect to its interface with its process atmosphere and any external atmosphere. 24 Equipment here is taken to mean all products within scope of Directive 94/9/EC. 25 The category classification is performed by the person responsible for making the EC Declaration of Conformity according to directive 94/9/EC. For example, the inside or process side of a pump for flammable liquid which normally runs full but occasionally contains an explosive atmosphere may, depending on the actual situation, be considered Zone 126 if no other measures have been taken to prevent the pump running dry. If it has been decided that the surroundings or external explosive atmosphere is Zone 2 then a pump conforming to Category 2 inside and Category 3 outside must be used to meet the Essential Health and Safety Requirements. Note: the process atmosphere zone (and the respective category) need not necessarily to be the same for the two connections to the process atmosphere. The category (or categories) assigned to equipment shall be determined for each part of the equipment which comes into contact with, or is connected to, a zone with a potentially explosive atmosphere (see Directive 1999/92/EC). The category assigned to a piece of equipment intended to contain a potentially explosive atmosphere not connected to the outside of that equipment is determined by the ignition risk associated with the outside parts of the equipment, not by its internal atmosphere i.e. only the part of the equipment which is intended to come into contact with a zone is relevant for the assignment of the appropriate category. The category (or categories) assigned to the process connecting points of equipment containing an explosive atmosphere cannot be higher than that appropriate to the ignition risk. For example, consider the case of a fan conveying an explosive gas atmosphere over its rotating blades, or a powder mill producing an explosive dust atmosphere inside the mill. Each having an outlet connected to an external potentially explosive atmosphere. The ignition risk assessment for both these items of equipment has shown for these specific examples that an effective ignition source (for the explosive atmosphere connected to them) is not present in normal operation but may be present in the case of an expected malfunction. If such equipment/assembly is placed on the market without additional ignition protection or a protective system it can only be classified as Category 327. Such equipment can only be used when it is connected to an explosive atmosphere which is present continuously (i.e. Zone 0/20) if additional ignition protection or a protective system is fitted (see Directive 1999/92/EC). fault are dealt with, Category 1 can be reached. the specific case, is installed in accordance with the manufacturer's instructions and no new ignition hazards are introduced. However, an ignition risk assessment will be required and relevant action taken (see section 3.7.5 on assemblies) if additional hazards are identified. Similarly, Directive 94/9/EC does not require that the pressure resistance of a vessel or container protected against the effects of an explosion by an autonomous protective system be tested, if it has been demonstrated that the autonomous protective system successfully detects and suppresses an explosion and if the vessel can withstand the residual pressure peak of the suppressed explosion. NOTE: The following is one of many examples that can be used to illustrate the above points. The assumptions made in this example should not be taken as the only possible situation. The categorisation of a particular piece of equipment will depend on the specific ignition hazard assessment that is made of the equipment and its intended use together with any ignition protection measures applied. The example only considers the inside and connecting explosive atmospheres, i.e. the process side. A separate ignition hazard assessment and categorisation must be made of the outside if the equipment is to be used in potentially explosive atmosphere. 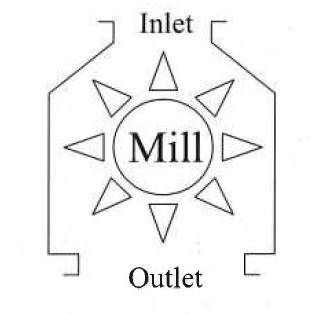 there is an ignition source inside the mill which can become effective during expected malfunctions. The highest category that can be assigned to the mill is therefore Category 3 when it is placed on the market as shown. The outlet from the mill in this case produces fine dust in the form of a potentially explosive dust cloud which is continuously present in normal operation, i.e. Zone 20. The manufacturer's instructions must therefore make clear that the mill can only be used with additional explosion prevention or protection measures. capable of causing an explosion through their own potential sources of ignition. It is clear that for some milling technologies an ignition source may be unavoidable. This definition applies to the grinding assembly of a mill for combustible materials of the food and fodder industry. Therefore, these are within the scope of Directive 94/9/EC. The intended purpose of a grinding assembly in a mill is the grinding of combustible materials whereby the content of fine particles is increased considerably. According to the risk assessment the grinding installation should fulfil the requirements for Category 1, but in the best case it will meet Category 3. Despite all construction measures to prevent ignition sources, the occurrence of dust explosions can not be excluded definitely. Therefore, the mill when fully installed must be provided with additional protection measures, which reduce the effect of a dust explosion for people and goods to below a dangerous level. These measures are essential for the grinding system to fulfil the requirements of Directive 94/9/EC. are necessary to make the grinding operation safe. The Directive divides equipment into two groups. In order to determine the appropriate conformity assessment procedure, the manufacturer must first come to a decision based on the intended use, as to which group and category the product belongs. Note: devices have to follow the conformity assessment procedure according to the category of the equipment or protective system they are required for or contribute to. Devices and components may be suitable for one or more category or group of equipment. Group II comprises equipment intended for use in other places likely to become endangered by explosive atmospheres. These Groups are sub-divided into Categories, as shown below. The way in which this categorisation has been developed highlights one of the main distinctions of Group I and II. For Group I, the categorisation depends on (amongst other factors) whether the product is to be de­energised in the event of an explosive atmosphere occurring. For Group II, it depends where the product is intended to be used in and whether a potentially explosive atmosphere, is always present, or is likely to occur for a long or a short period of time. These products are intended to be de-energised in the event of an explosive atmosphere. It is nonetheless foreseeable that explosive atmospheres could occur during the operation of Category M2 equipment, as the equipment might not be de-energised immediately. It is therefore necessary to incorporate protection measures, which provide a high level of safety. The protection measures relating to products of this category provide a sufficient level of safety during normal operation even in the event of more severe operating conditions arising, from rough handling and changing environmental conditions.30 This normally includes also the requirement to provide equipment with a sufficient level of safety in the event of operating faults or in dangerous operating conditions which normally have to be taken into account. Category 1 comprises products designed to be capable of remaining within its operational parameters, stated by the manufacturer, and ensuring a very high level of protection for its intended use in areas in which explosive atmospheres caused by mixtures of air and gases, vapours, mists or air/dusts mixtures are highly likely to occur and are present continuously, for long periods of time or frequently. It is also considered that equipment may be classed as Category 1, if the manufacturer provides a combination of protective measures to prevent an ignition source becoming active under fault conditions, and in addition an integrated protective system (see chapter 3.8) which will control the ignition hazard from a rare malfunction of the equipment. Category 2 comprises products designed to be capable of remaining within their operational parameters, stated by the manufacturer, and based on a high level of protection for their intended use, in areas in which explosive atmospheres caused by mixtures of air and gases, vapours, mists or air/dust mixtures are likely to occur. The explosion protection relating to this category must function in such a way as to provide a sufficient level of safety even in the event of equipment with operating faults or in dangerous operating conditions which normally have to be taken into account32. Annex II, paragraph 2.2 to Directive 94/9/EC. mists or air/dust mixtures are unlikely to occur and if they do occur, do so infrequently and for a short period of time only. The design of the products of this category must provide a sufficient level of safety during normal operation33. The various categories of equipment must be capable of functioning in conformity with the operational parameters established by the manufacturer to a certain level of protection. * Note: see as well the directives on minimum requirements for improving the safety and health protection of workers operating in potentially explosive atmospheres, e.g. those indicated in footnote 7. The equipment in the various categories must also comply with the relevant essential and supplementary requirements detailed in Annex II to the Directive (Essential Health and Safety Requirements). In general it can be stated that compliance with the Essential Health and Safety Requirements of Directive 94/9/EC is imperative in order to ensure the explosion proofing of equipment and protective systems. The requirements are intended to take account of existing or potential hazards deriving from the design and construction. However, following the philosophy of ATEX Directive 94/9/EC the notion of intended use is of prime importance too. It is also essential that manufacturers supply full information. Products relating to this Category must also comply with the supplementary requirements as detailed at Annex II, paragraph 2.3 to Directive 94/9/EC. designed and manufactured after due analysis of possible technical and operating faults in order as far as possible to preclude dangerous situations. Bearing in mind the commitments resulting from the relevant requirements of Directive 94/9/EC, a methodology on risk assessment, i.e. here ignition hazard assessment, should not only deal with designing and construction aspects but also provide a common format or language between designers and users. By using more than one technique the possibility of overlooking any relevant hazard is minimised. However, the additional time employed in using more than one technique needs to be balanced against the increased confidence in the results. The main output from the hazard identification stage is a numbered listing of hazardous events, which could result from the products involved as an input to the risk estimation stage. Hazard assessment methodology should comprise the hazard profiles including the accidental parameters that can reasonably be anticipated. These aspects become subject to a hazard assessment as a "series of logical steps to enable, in a systematic way, the examination of the hazards associated with products". a) Hazard identification: A systematic procedure for finding all of the hazards, which are associated with the products. Once a hazard has been recognized, the design can be changed to minimise it, whether or not the degree of risk has been estimated. Unless the hazard is recognized it cannot be addressed in the design. b) Hazard estimation: Determination of the Probability of occurrence of the identified hazards (and of the levels of severity of the possible harm of the considered hazards, see as well EN 1050). c) Hazard evaluation: Comparison of the hazards estimated with criteria in order to decide whether the risk is acceptable or whether the product design must be modified in order to reduce the risk. d) Hazard reduction option analysis: The final step of hazard assessment is the process of identifying, selecting and modifying design changes which might reduce the overall risk from products. Although risks can always be reduced further they can seldom be reduced to zero except by eliminating the activities. Options, which address the hazardous events that make the greatest contributions to the total risk, have the greatest potential to reduce risk. Effectiveness in reducing risk always starts with changes to the design concept, i.e. inherently safe design. For further information on risk assessment, see EN 1127-1 Explosive atmospheres -Explosion prevention and protection - Part 1: Basic concepts and methodology. For worked examples see EN 13463-1 Non-electrical equipment for use in potential explosive atmospheres - Part 1: Basic methods and requirements.